A small child stamps his foot and demands attention. 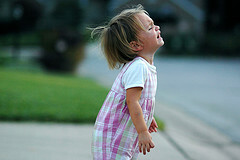 Tantrums become less effective as he gets older, however, and there comes a point of decision. He can become self sufficient, or find more successful techniques of manipulation. How many times have you seen this happen? Someone needs attention; they tell of their terrible misfortune. Wronged by a lover, falsely accused by a friend, passed over for promotion. Friends gather around and give emotional support. In that form it’s fairly harmless: we all exaggerate a little when we feel hard done by. Our society is rich enough to indulge adults a little, in the same way that it encouraged this behaviour in the first place because we had the time and energy to indulge the children. But people quickly tire of drama queens; what’s much more destructive are the subtle methods. Sometimes a traitor or a degenerate is found in our midst. People are mobilised to exclude the reprobate, and the process of circling the waggons allows a skillful narcissist who instigated the moral panic to become the focus and leader of a group in seige mode. The techniques are infinite, and very hard to pin down, because skillful emotional vampires take advantage of the best qualities of those around them: compassion, loyalty, trust. They are themselves outgoing, charming people with a large circle of friends. It’s often only after several cycles of crisis and drama, and after quite a few people have been damaged, that one begins to notice that each of these situations was like a social vortex which sucked people in and oriented their energy and attention around the vampire who created and managed the scenario. Traditional societies are rarely sympathetic to the ego and needs of an individual if it disturbs the harmony of the group. Instead there is an expecation that the groups needs are paramount, and this is magnified in situations where survival is an issue. Only among the aristocracy was there the level of self-centred narcissism which is now common in the west. It’s easy to see with drug addicts and ex-addicts – with very few exceptions they are the most self absorbed people you will ever meet. When you look a little closer it’s an epidemic. Very many or even most people in our culture are selfish to a high degree. Their focus is on how to make themselves happy, and this leads to addictive behaviour. Actually it’s rather childish, like living in a world of spoilt teenagers. More food, more toys, and most of all, more attention. Food, toys, and attention never satisfy for long – such children are easily bored. At the same time their techniques for obtaining their next fix become increasingly emotionally manipulative and destructive. The media and the education system are a big part of this problem. Schools are carefully designed to turn out compliant factory fodder, and the media reinforce a passive, hedonistic, envious outlook on life. Give me pleasure, make me happy. I want to have. Keep it simple, and keep it black and white. Like an action movie or a cop show it must have few layers and the motivations must be easily understood. Moral authority cannot be questioned, and the good guys have to win, but it helps if there’s a persecution complex to raise the drama. Everything should be framed in heightened, even apocalyptic, significance. We’ve seen it churned out at the movies over and over again. The hero cop stands accused through the treachery of the degenerate evildoer who plans to destroy all we hold good and true. Drug dealer, communist, terrorist, or simply slimy alien – it doesn’t matter. No one believes our hero and the odds are stacked against him, but he will triumph in the end. We need these stories; we cling to them. They make a context which provide meaning to our own sad shallow lives. They’re the passive version, the made to order version, of the social vortex created by the emotional vampire. We can cheer on our team as they fight the good fight; our own goodness thrown into relief by the evil of the enemy. It’s the fairy story which tells us why we matter, when nothing in our lives matters outside our own pampered skulls. Luckily we’re not alone in this. You could say that if the devil didn’t exist we’d have to invent him – but each devil we invoke is called into being by our hatred. The communists went from a struggling nation recovering from a devastating war to become an implacable enemy. The drug war looked like a bit of a damp squib for a while – you can’t fight hippies – but the Columbian drug lords stepped up to the plate. Then Bin Laden came forward with the gift that keeps on giving. Seriously, it’s got everything. There’s never been a story like it, combining Pearl Harbour, evil alien religions, terrorists under the bed, doomsday biological weapons. That’s not to say we didn’t work to keep it happening. Without the invasion of Iraq it might have looked like an unfortunate lapse in security which let some evil men kill 3000 Americans. Since then we’ve removed civil liberties, engaged in a war without end, and got ourselves a licence to kill. Modern politics plays on the same manipulative techniques you see from emotional vampires. There’s a vortex created to keep you seeing the world their way, and it orients all your time and energy around them, tying you up and sucking you dry. Are the terrorists real? Yes, but they’re no real threat to our way of life, and like Nietsche’s monster the best way to become what we fear is to fixate on it. Police, coastguard, tolerance, civil liberties and development aid are the best way to combat the threat. Al Qaeda then becomes the fringe group of dangerous nutters that it really is, instead of the evil empire of devilspawn we’re making it. Why are we letting the witchfinder general take away our freedoms and destroy our economy? Because we believe his story. It’s time to grow up. If we stop behaving like children we’ll force our politicians to act like adults. Both the media and the administration owe us the full story, not the soundbite. They’ve played on our loyalty and our trust but they deserve neither. Tell us the truth and stop scaring us with the bogyman. But that’s only half the story. What makes the terrorism threat so convincing is that it’s based in our genuine guilt and fear. The west has indulged itself while the rest of the world suffers, and in particular it has been distracted by its addictions while the corporate bully boys have been roughing up the neighbours. It’s time to wean ourselves off the lifestyle drugs and stand up to the corporations. They’ve been acting in our name and they haven’t been behaving themselves. There’s one world here. It’s time we started acting as if we were all in it together. Grow up, get control of your lives, and start being nice to one another for a change. This entry was posted in society, theory. Bookmark the permalink.